One of Japan's major automotive manufacturers and maker of class-leading vehicles including the Mirage, Outlander and Shogun, Mitsubishi is a name you can trust when searching for a pre-owned vehicle. 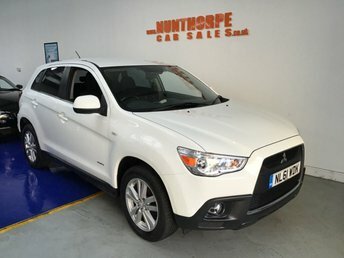 Start your search for a used Mitsubishi in Marske by the Sea right here at Nunthorpe Car Sales . We're a leading supplier of quality second-hand vehicles and with our help you're sure to find a model to suit your lifestyle and your budget. It's simple to browse our latest range of used Mitsubishi cars here on the website, but be sure to contact a member of the team if you'd like more information or are ready to book a test drive. Finance is available to UK residents aged 18 years or older, subject to status. Terms & Conditions apply. Indemnities may be required. Other finance offers may be available but cannot be used in conjunction with this offer. We work with a number of carefully selected credit providers who may be able to offer you finance for your purchase, commission may be received. We are only able to offer finance products from these providers. Postal Address: Nunthorpe Car Sales , Longbeck Road, Longbeck , Marske by the sea , Cleveland TS11 6HB. Find contact details here. Nunthorpe Car Sales is authorised and regulated by the Financial Conduct Authority, FRN: 747012. All finance is subject to status and income. Written Quotation on request. We act as a credit broker not a lender. We work with a number of carefully selected credit providers who may be able to offer you finance for your purchase. We are only able to offer finance products from these providers.